Development of pattern recognition algorithms. Provision of revolutionary ways to manage, treat and diagnose glaucoma. More than 80 million people worldwide suffer from glaucoma, an asymptomatic and irreversible disease of the optic nerve leading to blindness unless intra-ocular pressure (IOP) is controlled. Nyctohemeral patterns of IOP is the only treatable risk factor and cannot be effectively monitored with current devices leading to therapeutic failure and progressive visual function loss amongst about one in three patients who are not stabilized. 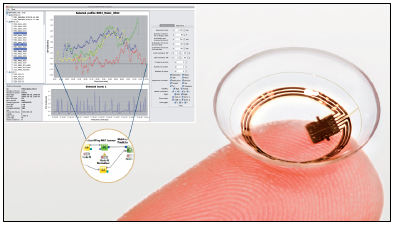 SENSIMED AG has developed Triggerfish, a wearable non-invasive solution to monitor continuously IOP. The purpose of the Sensimed Diagnosis project is to analyze, design and implement signal processing, feature extraction and pattern recognition tools to exploit the signals monitored by the Triggerfish. The analysis of such information, coupled with pattern recognition techniques and knowledge extraction has the potential to provide revolutionary ways to help the diagnosis of glaucoma as demonstrated by a recent pilot clinical trial. The HES-SO Wallis and Fribourg have developed pattern recognition algorithms industrialized into a knowledge extraction platform able to verify and identify existing patterns while ensuring to collect and store the data in a convenient database. The principles are to build glaucoma and healthy patient models using advanced statistical modeling like Gaussian Mixture Models (GMM) or Support Vector Machines allowing high detection results of the illness.